Dodge is under another winter weather advisory from the National Weather Service. This is getting insane. While I realize we don’t have near the problems most of the northern states have been facing, for Dodge City, it’s been ridiculous. It’s cold and dreary out this evening. 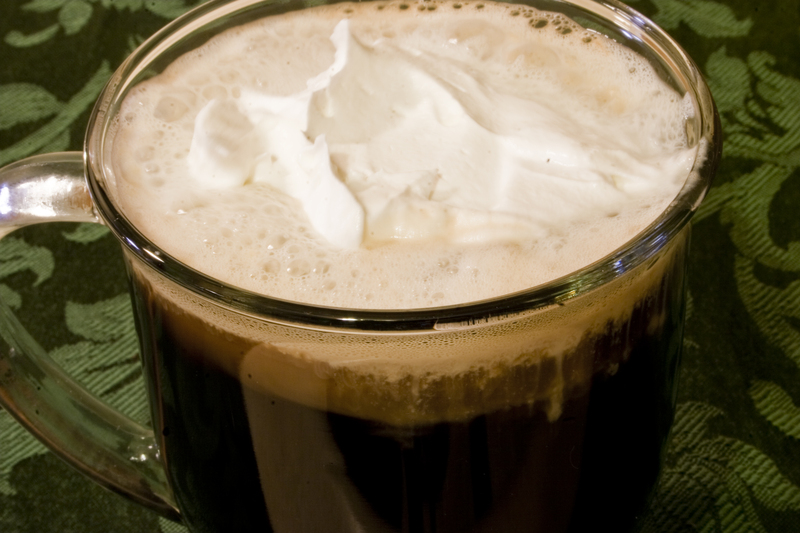 But, we’ve got some killer BBQ to heat up on this cold winter’s night, so what better way to help warm up than to try another coffee-based, Ireland-themed drink? This one is a play on the traditional Irish Coffee I made earlier this week. Tonight’s drink: the Irish Winter. Pretty similar, no? The coffee liqueur ads a different kind of sweetness than the brown sugar syrup does. That’s what’s nice about these coffee-based drinks. There’s almost an endless array of ways to tweak the drink to create something similar, yet completely different from it’s base. Think of it like a martini — you have your base alcohol of vodka or gin, and the rest is up to you. Yeah, I re-used the same photo. Trust me. It looks the same. Quite good. Nothing too offensive. Just make sure you’re using good quality ingredients.